It is with deep sadness that we share the news of the passing of Susan Wilkey. Susan was the Village President for the Village of Chenequa up until the time of her passing. 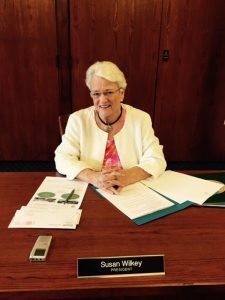 Susan served on many boards and committees for many causes she held close to her heart, along with the Village of Chenequa. She will certainly be missed greatly by all of the staff. We would like to thank her for many years of service, leadership, dedication, generosity and above all just being Susan. Visitation is Wednesday, October 3rd at St. Charles Catholic Church in Hartland from 10:00 a.m. until 12:00 p.m. Services start at 12:00 p.m. followed by a reception at the Chenequa Country Club. Evert-Luko Funeral Home in Hartland is managing all the arrangements. To view her full obituary, please Evert-Luko Funeral Home website.